Sani-Tech® molded silicone assemblies are constructed of a biopharmaceutical platinum-cured silicone, which utilizes our unique S.I.B.® (Smooth Inner Bore) technology. 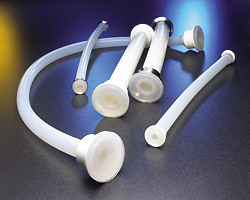 Sani-Tech® molded components allow for the fabrication of tube and hose assemblies with a smooth virtual crevice-free interior surface that extends over the sealing face. The entire assembly has one internal diameter that eliminates bacterial traps and assures maximum flow rates with minimal pressure drops. This assembly system is supplied with a custom built-in male sanitary gasket (female groove also available), eliminating the need for an independent gasket and potential alignment problems. Molded assemblies can be supplied with either stainless steel or polysulfone back-up support cups. Sani-Tech® and S.I.B.® are registered trademarks of Saint-Gobain Performance Plastics.